Almost a year ago, I wrote that Rex Ryan deserved to be fired for punting on fourth down with a little more than four minutes left in overtime against Miami, dooming Buffalo’s 2016 season. On Sunday, Sean McDermott chose to punt on fourth down with a little more than four minutes left in overtime against Indianapolis, keeping the Bills in the midst of the playoff race for at least another week. McDermott’s call worked, while Rex’s blew up in his face. Which, as usual, was the difference between brilliance and idiocy. There were a few key differences, of course. Ryan put his confidence in a defense that hadn’t stopped anybody all year, over an offense in the midst of a team record-setting day led by Tyrod Taylor, who was delivering his best professional performance. McDermott’s sudden-death quarterback was Joe Webb III, who had not, until Sunday, completed a regular-season pass since 2011. Webb was only allowed to touch the football due to injuries to Taylor’s knee and Nathan Peterman’s brain, and because the Bills were legally required to do something between Colton Schmidt’s punts. Then there was the snow. And the snow. And the snow. 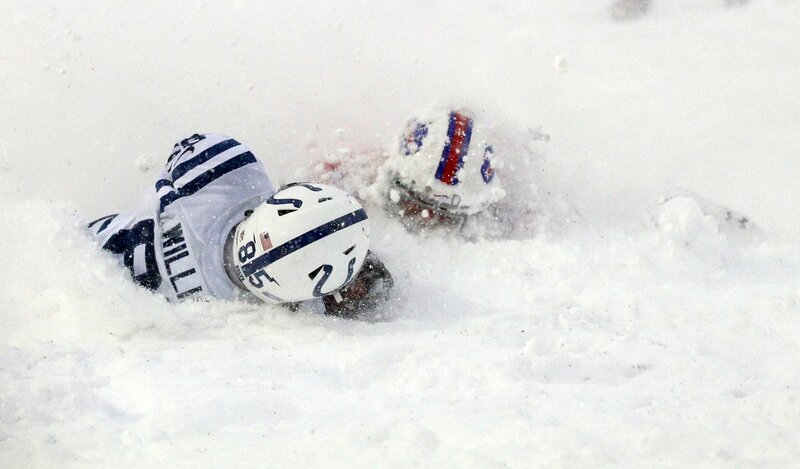 For most of the first half, little of which could be seen clearly even on television through the lake-effect band that settled in less than an hour before kickoff, the Bills and Colts appeared more concerned with remaining upright than attempting to advance toward the opposing end zone. Visibility was almost non-existent. Punts burrowed in the growing pile blanketing New Era Field and stayed there. And the handful of passes attempted by Peterman and his Colts counterpart, Jacoby Brissett, generally also wound up being dug out of the drifts. Then came the most unlikely hurry-up drive I’ve ever seen, given the conditions. The Bills took over with 1:42 left before halftime. LeSean McCoy managed to keep his feet while teammates and defenders around him were losing theirs, twice, for gains of more than 20 yards. Peterman then heaved a pair of throws toward Kelvin Benjamin. The 6-foot-6 trade-deadline acquisition somehow saw the ball and came down with it both times, the second in the end zone. It snowed (repeated 241 times). Then LeSean McCoy made a couple nice runs and Kelvin Benjamin came up with a couple sweet catches. And it snowed some more (repeated another 100 times). Instead, the Colts got the ball at their own 23 with 9:53 left in the fourth quarter. And embarked on the most unlikely drive I’ve ever seen, period, given the conditions. Brissett, who last year was unable to lead the New England Damn Patriots to a single point against the Bills (the lone shutout of Ryan’s Buffalo tenure), suddenly put it all together. He completed six passes, one more than he would the rest of the day. One connection with T. Y. Hilton converted a fourth-down situation, with Brissett scrambling for another. After Brissett threw to Jack Doyle for a touchdown on the 19th play of the march, then again for an apparent two-point conversion to give the Colts an 8-7 lead, it looked like the Bills were going down in the Billsiest of possible ways—falling to a terrible team quarterbacked by a fill-in during a the sort of storm that stereotypes Buffalo for the rest of the world. Then came the flag. The offensive pass interference call was questionable, at best. But no doubt, it saved Buffalo’s season. Adam Vinatieri somehow made the ensuing 43-yard extra point, though he missed a field goal from the same distance after Webb threw one of the ugliest interceptions you will see this side of Peterman’s debut in Los Angeles a few weeks back. All of which set up McDermott’s big choice in overtime. His decision cost the Bills 24 yards in field position and nearly two minutes of a dwindling clock. But his defense held (thanks in part to three straight passes by the Colts). His quarterback, mainly known as a special-teams guy until Peterman left with a concussion in the the third quarter, hit Deonte Thompson, who joined the Bills in late October, with a 35-yard bomb that would have been unthinkable for most of the day. Three plays later, McCoy shot up the middle for 21 yards, making his team a winner and his coach a relative genius. With three games left (one in New England and two against the Dolphins, who stunned the Patriots on Monday night) the Bills are tied for the final playoff spot. Stranger things have happened. Not sure the same can be said of what went on Sunday in Orchard Park.